Students who leave any public school — virtual or traditional — to be homeschooled would count as dropouts under the school’s graduation rate. Behning said he thinks schools abuse this option and those students, who might be more difficult to educate, end up in virtual schools. Does Rep. Behning believe that families providing a home education are dropouts? Absolutely not. The issue is whether or not schools are misreporting the number of students withdrawn to homeschool in an effort to protect their graduation rates and funding. Labeling chronic truants and dropouts as homeschooled students is a shell game with potential implications for all involved. IAHE Action and our sister organization IAHE have been fighting this issue for years. In 2013, a law was put in place in an attempt to address the problem of high school dropouts being categorized by the public school as homeschoolers. 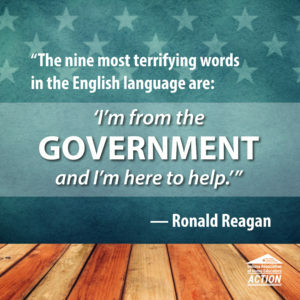 When a family asks to withdraw their student from a public high school, the school is required to provide families with counseling and information about Indiana law on home education (non-accredited, private schools). Section 10 of House Enrolled Act 1005, added I.C. 20-33-2-28.6, a new section, to law. I.C. 20-33-2-28.6 provides the following: (a) This section applies to a high school student who is transferring to a nonaccredited nonpublic school. (b) Before a student withdraws from a public school, the principal of the student’s school shall provide to the student and to the student’s parent information on a form developed by the department and approved by the state board that explains the legal requirements of attending a nonaccredited nonpublic school located in Indiana. The principal and a parent of the student shall both sign the form to acknowledge that the parent understands the content of the form. (c) If the parent of the student refuses to sign the form provided by the principal under subsection (b), the student is considered a dropout and the principal shall report the student to the bureau of motor vehicles for action under section 28.5(g) of this chapter. The student is considered a dropout for purposes of calculating a high school’s graduation rate under IC 20-26-13-10. 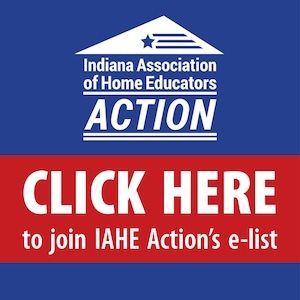 In 2017, IAHE Action worked with Rep Behning to stop schools from mislabeling students that were withdrawn from the public school system to homeschool as dropouts. In an attempt to curtail this practice, HEA 1384 contains language that prohibits a school from classifying a student as a homeschooler unless the school has substantial evidence that the parent or guardian of the student initiated the student leaving the public high school or an accredited nonpublic high school. The Indiana Department of Education may require the school to produce this evidence if it is ever requested. It will be important for the school to have evidence in writing that the parent initiated a transfer to homeschooling. Faced with the staggering failure of Indiana virtual schools, the legislature is once again trying to hold public schools accountable. And, one of the key metrics for evaluating a public school and granting funding is a school’s graduation rate. 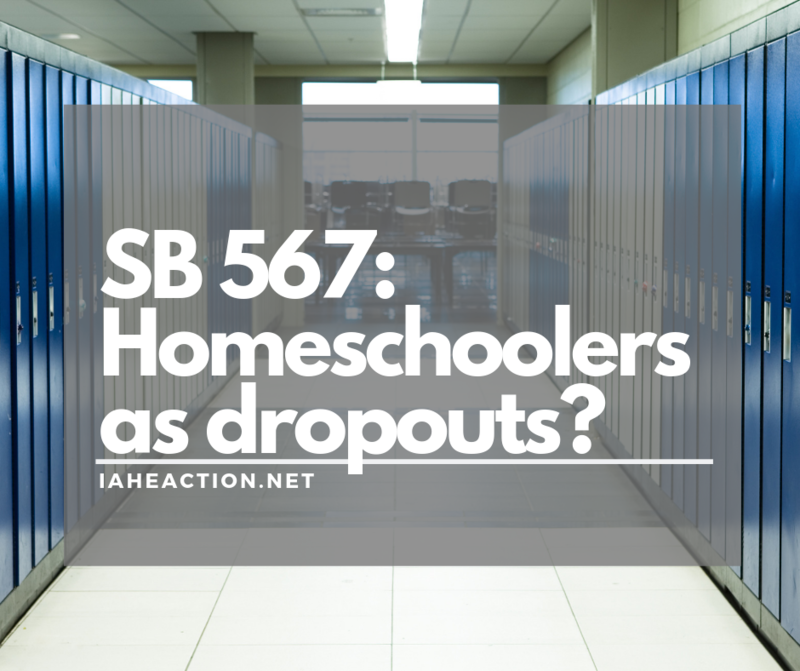 One of the things that the original language in SB 567 attempted to do was to increase school accountability by removing the distinction between dropouts and students withdrawn to homeschool. SB 567 is a bill regarding increased oversight and regulation for virtual schools (generally a good thing). Among other provisions, Amendment #14 removes the “homeschool exemption” from the list of allowable reasons for a student to be removed from a graduation cohort. This means that, if passed/enacted, any student who withdraws from your high school for reason of “homeschooling” will count as a drop out in your high school’s graduation rate. This amendment will negatively affect the accountability grade of many public high schools. 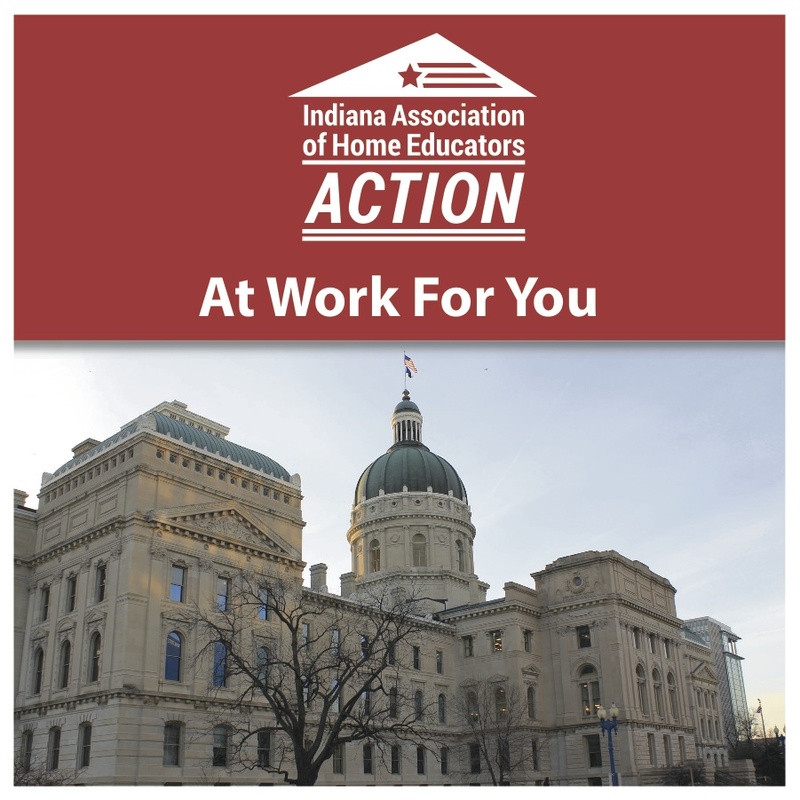 As this bill moved from the Senate through the House, IAHE Action spoke with Rep. Behning to share our concerns about the implications of grouping new homeschool students in with dropouts. Behning authored and passed a House amendment that reinstated the homeschool exemption on April 9th. Are schools mislabeling their withdrawn students in an effort to retain their school’s letter grade and funding? 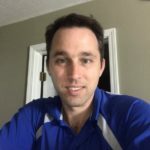 Are schools coaching families to complete the homeschool withdraw form… even if the family has no intention to continue their child’s education? Are families being pushed into homeschooling without any understanding of home education? In 2018, twelve public schools reported that more than 10% of their high school seniors left to homeschool. Over seventy schools reported withdrawal rates of seniors higher than 5%. The IAHE has contact with a large number of families that make the decision to homeschool in order to complete their student’s high school education, but these numbers do not reflect what we see across the state. Today, Chalkbeat contacted the IAHE to ask if our organization receives calls from families that were pushed into homeschooling by their public school. 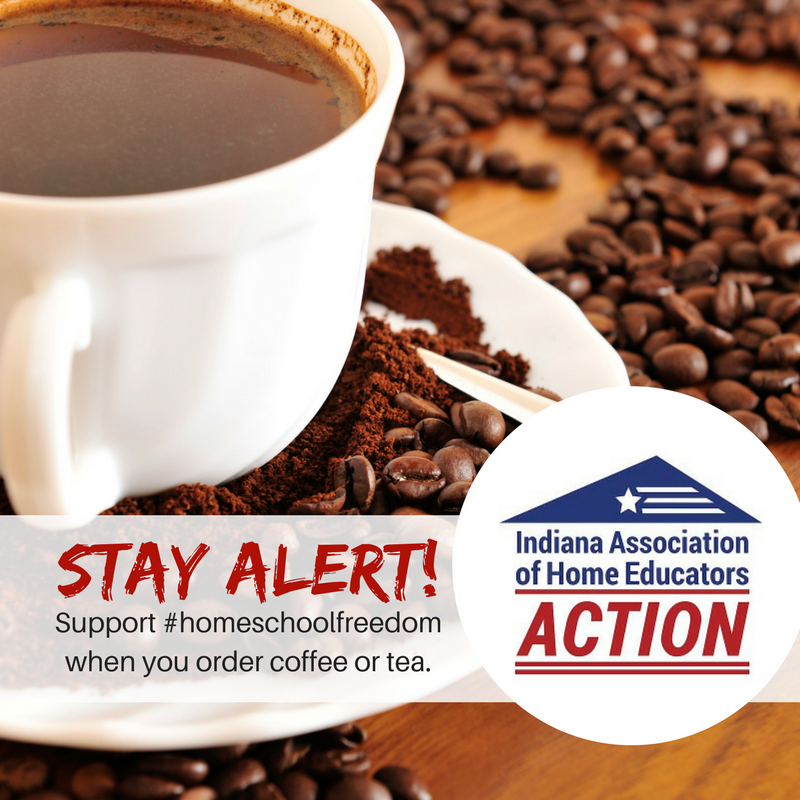 Our team continues to field calls from parents sharing their stories about school officials “signing their child up for homeschooling” on the Indiana Department of Education’s website — even when the parent has no clear understanding of home education. As with any parenting challenge, no one begins homeschooling knowing everything they need. It takes time, research, sacrifice, and hard work to be successful. Most importantly, it takes commitment. We believe that parents are capable of providing a quality home education if they are dedicated to the challenge. But, parents should NEVER be forced into an educational choice by someone else. The current process of evaluating public schools is broken. The rampant mismanagement of the virtual public school programs has only put a spotlight on an issue that has been present for many years. The debate over SB 567 and the schools’ “homeschool exemption” has only made it clear that abuse of the system is still happening. In spite of the flaws and abuses in the current process, it is balanced by the need to maintain a distinction between high school dropouts and families deciding to homeschool. 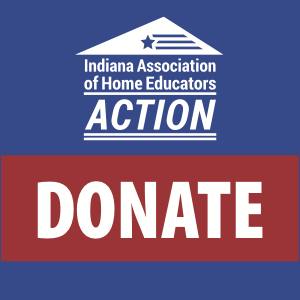 IAHE Action and IAHE are in support of SB 567 as it retains the current homeschool exemption for schools without increasing oversight for families. Last week, IAHE Action shared about Senate Bill 266 which allows for mental health screening for all children through the age of 22. (Read the original post here.) Based on our conversations with one of the bill’s authors Sen Dennis Kruse we asked families to call and ask for the original language of the bill to be reinstated. What has become clear since that time is that under the guise of mental health, SB 266 will give the government wide-reaching powers beyond what it already has to test, evaluate and treat our children. Senate Bill 266 has become a massive vehicle to cover a variety of mental health programs paid for by the State of Indiana. What we originally liked about SB 266 was the effort to give schools tools balanced by various protections and penalties that Sen. Kruse had placed into the bill. 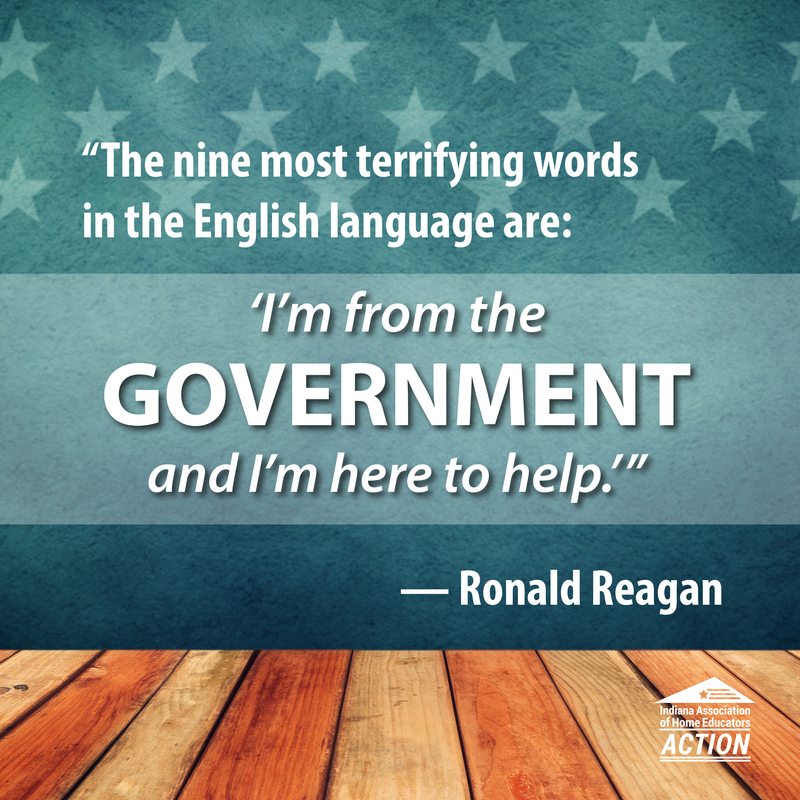 But below the surface, the bill gives control over our children’s well being to the state. When the government decides it’s their responsibility to evaluate the mental health of all children, we know that means parents will have fewer rights recognized to raise their children as they see fit. At this point we don’t believe the bill can even be amended to our satisfaction. We are encouraging you to contact your State Senator and ask them to vote no on SB 266. Yesterday we saw an uprising on Facebook with a call to action over proposed legislation, SB 266. It’s the kind of bill we worry about every day the General Assembly is in session. You should know, right off the bat, we need you to contact your State Senator right away. 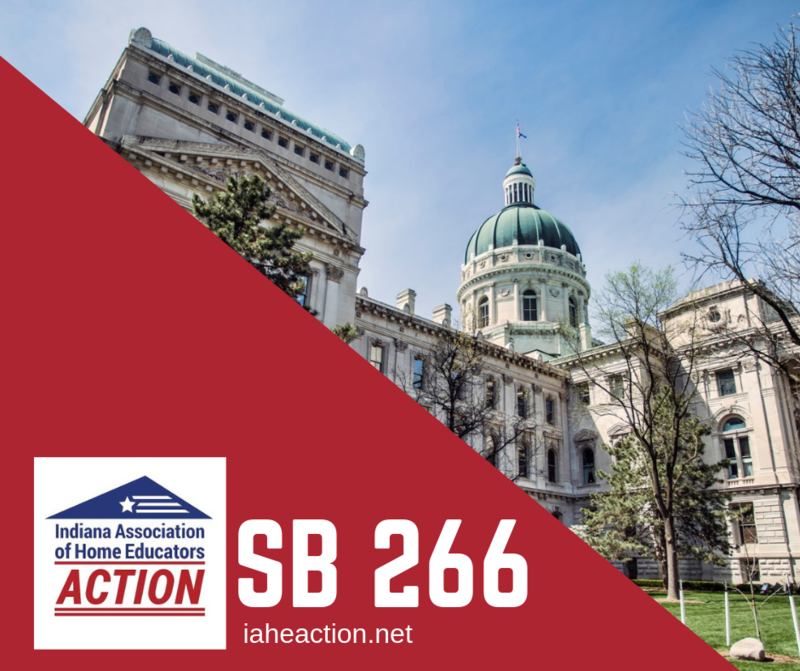 One of our closest allies in the State Senate, veteran home school parent and former Education Chair, Sen. Dennis Kruse, informed us that SB 266 was amended in a committee hearing last week. And, he’s not happy about it one bit. In fact, even though he’s listed as a co-author of the bill, he told us that he plans to vote against the bill unless the bill is fixed. You see, SB 266 is the BIG attempt this year to expand mental health services into the schools. Public, charter, private, all of them. And that means schools will be in the business of conducting psychiatric and mental health surveys and treatments on children from birth to age 22. While the bill pays lip-service to parental consent, Sen. Kruse had wisely added into the bill a variety of protections for parents and students and also penalties for schools that didn’t follow the law. But the public-school lobby quickly moved into action and had Sen. Kruse’s protections stripped from SB 266. As the bill stands now, the schools could prescribe a psychological evaluation or treatment to a minor without fear of penalty of the law. We have seen way too many instances over the years of where schools are ignoring the law and trampling the rights of parents and our kids. Having clear penalties for violations of protected health information and consent is the least we can ask for. Right now under the guise of “mental health” Republicans and Democrats in the General Assembly are moving ahead to let schools do whatever they please and spending millions to do it. Please call your Senator today at 800-382-9467 and demand they restore Sen. Kruse’s protections and penalties in SB 266. We can’t take any vote for granted. The next vote will be before the entire Senate. If enough Senators hear from us right now, we can get this bill fixed so that schools will be accountable to the law. This year, the Republican Superintendent of Public Instruction has vocally led the charge to lower the compulsory attendance in the state of Indiana. The Indiana Department of Education (IDOE) published a nice, full-color, eight-page handout laying out the arguments including a list of all 50 States’ compulsory attendance ages. This was to highlight how “backward” Indiana’s seven-year-old compulsory age is in comparison to the rest of America. Indiana is not alone. There are twelve other states who have chosen the same or older age. Considering the fact the United States regularly tests squarely in the middle of the International PISA exam results, is it wise to look to ourselves for education models? Does the IDOE publication use the right yardstick with which to measure our state? Perhaps it might be better to look at the top scorers of the international PISA test to judge the wisdom of a compulsory attendance age of 7 years old. The Program for International Student Assessment (PISA) does not follow the pattern of most exams. This test is designed to identify critical thinking, problem-solving and communications skills, not academic exercises that test memorization, teachers or curricula performance. On the PISA test, one must know how to manipulate the knowledge in their heads, not just spit out information. For example, questions regarding monetary matters require students to devise their own monetary system from which to arrive at the answer. It is not enough to know how their country’s money system works. They must be able to mentally re-create a monetary system demonstrating a thorough knowledge of how money works in math and in society. Amanda Ripley does an excellent job walking through the PISA exam in her book, “The Smartest Kids in the World: and How They Got That Way”. So, when do the “smartest kids in the world” start school? Finland, whose educational reform has recently gained renown, scored in the top ten of the PISA science and reading exam and has a compulsory attendance of age seven. Our northern neighbors, Canada, have compulsory attendance beginning at six or seven years, depending on the province. Singapore scored first on all three PISA tests (reading, science, and math) and has a compulsory attendance age of six. Japan also ranked on all three exams and also boasts an age six start. The small eastern European country of Estonia made the list on all three exams with a seven-year-old beginning to formal education. Hong Kong children can start as young as three to six years in Kindergarten, but primary school does not begin until seven years of age. The countries listed above have all been recognized, for many years, by academic excellence, yet none of them start primary school at age 5. Also note, the countries who scored well come from vastly different cultures and continents. It is hard to believe American children are somehow developmentally different from children in Europe, Asia, and Canada. More and more studies are beginning to cast shadows onto just how effective lower compulsory attendance is to socio-emotional learning, physical health, college entrance, and graduation. These are all excellent questions to ponder when making sweeping public policy changes on all children, depriving 100% of parents their rights to determine the appropriate age to begin formal education. While there is no opposition to making education available at earlier ages when ready, there should be vigorous opposition to mandatory early start ages for formal education. Parents, not the government, remain the best authority on the readiness of their children to start full-day Kindergarten five days a week. Let’s also make sure we are measuring success by those who have proven successful.